If you hate having surprises ruined look away. Look away now. Don’t let your eyes stray to the picture. Too late? Oopsie. So, earlier I gave you one mysterious hint about the next BrightSea Village building. I said there was a horse and here he is. I imagine now that you’ve seen what he’s pulling and the style of building he’s standing in front of you’ll know exactly what’s happening here. As you can see I’m more than halfway through stitching the roof, always a bit of a bugbear for me. The stitching always seems to go faster once I get over that hurdle. As roofs go this has been more interesting to stitch than most. 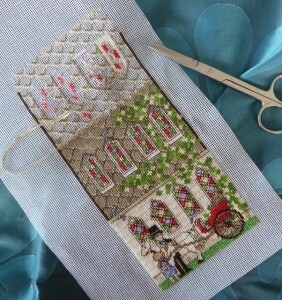 I am so looking forward to stitching the front and back of this one though. That’s where all the excitement is. Wait and see. This entry was posted in BrightSea Village on July 17, 2015 by Elli Jenks.